The wine has a brick red color with a bouquet of red raspberries, spice and white pepper. The palate is incredibly concentrated and rich. 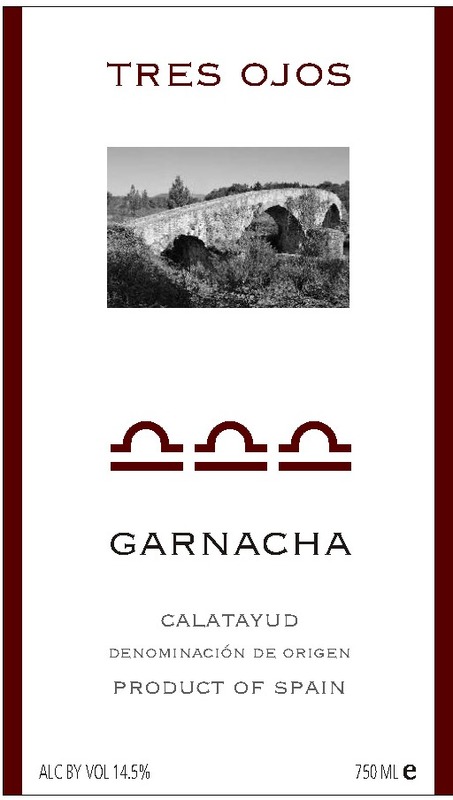 The modern styles of Garnacha in Spain are continuously being perceived worldwide as wines of extraordinarily good quality. This wine is fruity, juicy and shows a great depth, ripe tannins, length but yet with wonderful elegance and lightness. Tres Ojos is made at the Bodega San Gregorio, a cave co-op founded in 1965 that counts 160 members. The president is Gregorio Abad Gil and the vice president is Jose Maria Hernandez. They sell wine to nine different countries. The winery is located in the Ribota River Valley, some 15 kilometers north of the city of Calatayud. Tres Ojos hails from the D.O. Calatayud, located in Aragon, a province unparalleled in Spain by its variety of landscapes (lush river valleys, mountainsides and semi-desert areas.) The name Calatayud derives from a Moorish governor named Ayud who built a castle (qalat) at the confluence of the Jalon and Jiloca rivers (qalat Ayud.) There has been thriving population here as far back as Roman times when the old city of Bilbilis was used as an important staging-post for the Roman legions on their way north to Gaul. The coop cultivates 820 hectares (2,025.40 acres) of primarily Garnacha (62%), Tempranillo (22%), 7% white Macabeo and 9% Cabernet, Syrah & Merlot (a mix). Most of the vines are at least 40 years old and some are 50+. The vines, planted “en vaso”(head-trained) are not irrigated, offering very low production levels. Local soils are rich in limestone, marl and slate, providing plenty of opportunities to make good wine on a regular basis of which Tres Ojos is a perfect example. Tasting Notes: Deep, dark ruby color, aromas of blue fruits, confectionery and subtle licorice characters, thick luscious palate with good structure and soft finish. The Blend is 44% Rubired, 31% Durif and 25% Shiraz. Rubired is a cross between Tinto Cao and Alicante Ganzin (which is itself a cross between Alicante Bouschet and Aramon Rupestris Ganzin). It is known for being particularly adapted to the hot climate and producing dark wines, as the color is not only coming from the grape's skin, but also from the grape juice itself. It was developed in 1958 by H.P. Olmo of the University of California Davis. Durif, also known as Petite Sirah, is also a cross of two different grape varietals: Syrah and Peloursin. It was created by French botanist François Durif in 1860 while keeping Syrah and Peloursin plants under the same roof; it happened from a natural process called "cross-pollination." The grape itself is known for its very aromatic, plummy character. Shiraz, which we all know for being the most recognized grape varietal of Australia, brings some minty, spicy and fruity characteristics to the wines. Grapes are crushed and destemmed then placed in rotary fermenters where three rotations per day break up the cap and extract color and tannin. Commercial yeast is added for fermentation. The juice is pressed to stainless steel for malolactic fermentation, undergoes oak maturation for 9 months, then is stored in stainless steel. Pairs well with BBQ lamb with roast vegetables. Juicy and fruity, Australian in style with blackberry, blackcurrant and spice flavors, subtle vanilla and black pepper. Smooth and well balanced, a lingering finish of berries, spice and beautifully integrated oak. Pairs well with red meat, especially classic recipes like roasted leg of lamb, grilled lamb chops and beef kebabs. Deep ruby red color with violet highlights and a pleasant and fruity bouquet. Full bodied, soft tannins and good acidity.